We have an appointment at 1pm with a guy [Frank] who may make a bid to buy MsTwayler. We do not intend to make a sell decision today. We want to get several bids before we decide who the lucky one is to be! However, if this RV Guy makes us an offer that cannot refuse, well, that's a horse of a different color! The job of this morning is to tidy up MsTwayler so that she looks presentable. Right now she looks the same as she did when we left on our Scampy trip last May. A big mess! Have we Blogged to you before, that while we are at Lone Wolf, we are staying in MsScampy? It's true! We live in MsScampy. Eat here. Sleep here. I've been removing stuff from MsTwayler. Cleaning floors. Taking down stuff from walls [Pics, brackets for Boid's cage, Etc]. MsTwayler looks in better shape now than when I was living here! I need to rest a bit. So, although there is still odds and ends to do, I'm taking a rest. Frank has not arrived yet [He's due at 1pm]. I'm sitting in my La-Z-Boy recliner. I've powered up our Mac and went online to Blog to you about something that occurred to me only a few minutes ago! A remarkable thing had to happen in order for me to be in the fantastically wonderful situation that I am in right now. And what was that thing? Jojoba Hills SKP RV Resort had to give me the boot! I am pretty sure, that I would not have quit Jojoba myself. And why did Jojoja boot me out? Well, I believe that my being arrested for that 911 incident was the catalyst. And of course, my openness in my Blog writing. I have a hunch that it was from my Blog that Jojoba learned about whatever they objected to about me. When this RV Guy did not show up to make our appointment, it occurred to me that perhaps this is a "planned no show." If I now phone this RV Guy, he may believe that he does not have any other competition to buy Twayler. As it turns out, however, I cannot phone him. Didn't write down his phone number! I'm fast coming to the conclusion, that I gotta sell Twayler myself. Doing this myself, I believe, will get Twayler the best exposure. Because I am able to advertise all over the place! MsTwayler - In all her glory! Here is our ad on Craigslist [Link]. PS: Already I have a guy sniffing at the Craigslist ad! wonderful things with a little spice thrown in between! Without a little luck and good fortune, where would I be? Gotta get interior photos George! You are absolutely correct. In fact, a responder to my Craigslist ad asked for interior pictures! I will do that this morning. How about a description of the floor plan? Front bedroom? A pic of the floor plan would be even better. I believe that I can publish a floor plan in to my Craigslist ad. On the interior photos if you do, apart from amenities, a couple of long shots from one end to the other and reverse. That's a problem dealers make, they post pics of specific items and many like to see the layout. Also post a pic of the floorplan. Good luck, it's a beauty of a trailer. Long shots of the interior and reverse. Having just sold a motorhome last year, I have to remind you that Craigslist and Ebay are loaded with scammers. One common one is they'll tell you they want to buy it sight unseen and the whole process will be backed by an agreement with Ebay. They say they'll send someone to pick it up and you'll get paid by Ebay. There are many variations on this, so be alert. 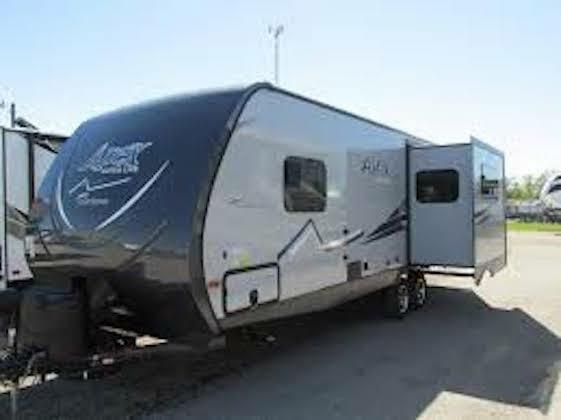 I like the idea of working with one of the many RV consignment sellers. I plan to go to my local bank this morning in order to learn how to protect myself. I agree with some others on more pics and a floor plan. Yes! And this morning I will post more pics and a floor plan. George, Your only photo is a bit hazy. Photos can SELL things. The more , the better. Take nice clear photos inside and out. That is how you attract buyers. I shall do this today! Check my ad. My new pics should be on my Craigslist ad before noon. I love your attitude about Jojoba, George! I have a lot in the Pahrump SKP park and so far I'm happy with it. But who knows what the future holds. The idea of adding more pictures to your Craigslist ad is a good one. I've spent some time browsing CL and in fact have bought 2 RVs from there. As Joe mentioned, scammers are a problem on CL. Both as buyers and sellers. One of the tipoffs that an ad may be bogus is if it only has one picture. Often scammers will take a stock photo of an RV and write a phony ad around it, hoping to snare at least a deposit from an unsuspecting buyer. Pictures of the interior from various angles are harder to come by and add legitimacy to the ad. Thank you for taking time to help me. George, you're Craigslist Ad is fine but if you're soliciting suggestions, I would add a pic showing the interior fridge, a pic of the stove and a pic of the shower. When you're talking about the recliner, I would just say you installed a recliner instead of justifying it. Not sure how a single recliner is good for a couple. My two cents and worth less. I am going to take your advice about pics of stove, fridge and shower. Also, change text about the recliner. Having just sold a motorhome last year, I have to remind you that Craigslist and Ebay are loaded with scammers. One common one is they'll tell you they want to buy it sight unseen and the whole process will be backed by an agreement with Ebay.